How can PRTG notify me if my system can no longer copy files on my External HDD? I have a Linux system, and I am continuously running a backup of my files to a external hard drive. One time, I encountered an error where my system can no longer copy files to my External HDD because it has lost its writing permission. I know that there is no built-in sensor that could help me with this issue, and this is quite tricky. I am thinking of a workaround where I will use SSH Disk free sensor to monitor the external HDD, and I want it to notify me if the disk space is not changing anymore. However, I can't find a way that PRTG will trigger a notification if this happens. you can use our SSH Script-Sensor for this. # if it is writable return "1"
# if not return "0"
echo "2:0:Path '$1' is not writable!" echo "1:0:Path '$1' does not exist!" 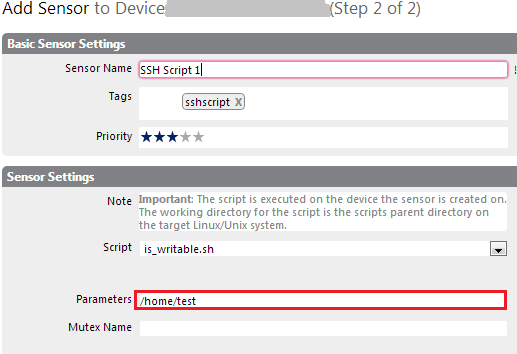 After making it executable you can add the ssh-script-sensor in PRTG and provide the path to check as parameter in the sensor settings. If the path is not writable you will be alerted with a down-state, if the path does not exist you will see a warning-state. Wow, thank you a lot! That's exactly what I am looking for. Anyway, I'm sorry but I'm really not familiar with these scripts, may I know where exactly should I insert the path that I want to monitor in this script? For testing purposes you can also add it as a commandline-parameter during execution, e. g. '/var/prtg/scripts/is_writable.sh /home/testuser'. Thank you for your quick response. I have successfully created a script on my Linux and use it on my SSH Script sensor. It worked, however, it always says that the path is not writable even though I can write files in that path. I am using root as its SSH credentials. Are there any adjustments that needed to be done? Maybe the paths for the 3 commands at the start of the script need to be adjusted to your system. Try to figure out which paths are correct on your system using 'which <command (touch|rm|grep)>' and modify the variables to the results.